Partway through Old and Weird's mid-afternoon set in the parking lot of Halifax café/rock climbing locale 7 Bays Bouldering, guitarist and vocalist Danika Vandersteen took a moment to discuss the state of the band, noting that fellow guitarist Allison Higgins now resides in Montreal: "We're trying to make new things happen… should I move? What do you think, little buddy?" She was speaking not to the audience, but to the cute little black dog that decided to wander right into the middle of the staging. The dog was, unfortunately, silent in its opinions about Old and Weird, but the band's set was well received by the humans in attendance. 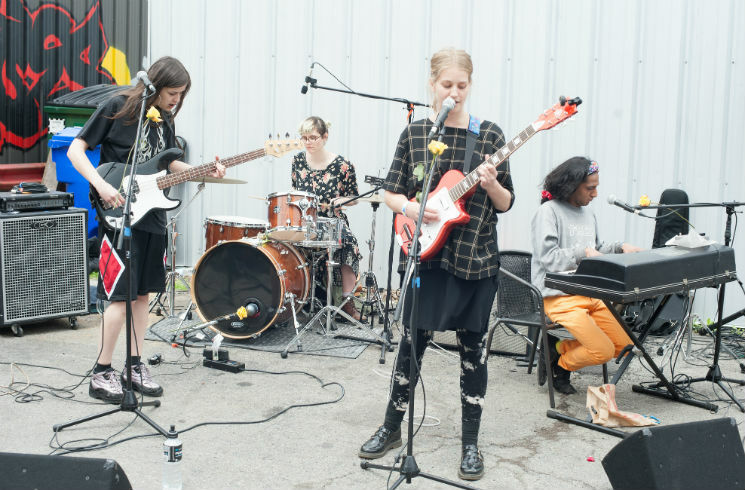 Vandersteen, Higgins and bassist Hannah Guinan were joined Sunday afternoon (May 29) by drummer Cheryl Hann and keyboardist Nick Dourado, delivering a set that combined 1960s pop hooks with frantic detours into noisy, spiralling patterns. Overtop, Vandersteen and Guinan's harmonized, high-register vocals presented an almost childlike sense of playfulness, a sort of performed amateurism that aligned well with the boisterous enthusiasm of the songs themselves — which, by set's end, had even the toddlers attending with their parents bouncing as high as they could.